Overall, this is a very good and highly recommended overview of the genre and its history. This is a tall order – covering forty-plus years of progressive rock – but Romano achieves this lofty goal with finesse and clarity. It is a fine book and a thoroughly enjoyable read. The writing style is lucid and eminently legible. Stylistically, Romano tends toward the anecdotal over the analytical approach. But, this does work in a rather refreshing manner, as he effectively uses copious interview quotations to both explicate and flavor his history of prog. The book is not overwhelmingly text-centric, as photographs easily occupy something close to half of the volume’s page-space. Much of the layout is interesting, varied, visually engaging, and even inspired. Being broken down into many smaller chapters, it is also a very user-friendly, digestible read – in longer or shorter sittings. The chapter division are generally well-conceived and executed. While promising a “History of Prog Rock,” Romano’s history is overwhelmingly slanted toward the symphonic progressive styles. While this will doubtless annoy those with a penchant for other sub-genres (particularly Rock in Opposition and other Avant-leaning manifestations), there is a logic to this emphasis, given the higher profile and influence of the more symphonically-leaning bands in the larger history of prog and rock in general. Equally, it is refreshing to see chapters devoted to the Canterbury scene, Krautrock, and even Folk-Prog. The book’s flow is arranged in a loose approximation of the chronological development of the genre, with specific discussion of major bands (and sub-genres) in individual chapters. Romano sets the stage well, opening with the challenging (and thankless) endeavor of defining “What Is Prog?” and following this with a chapter on early influences and the embryonic development of Progression in Rock (The Beatles, The Moody Blues, Zappa, etc). Not surprisingly, the six most well-known bands associated with prog rock are then each given an individual chapter – Pink Floyd, King Crimson, ELP, Yes, Genesis, and Jethro Tull. These obvious inclusions are followed by a series of chapters that thankfully address occasionally overlooked players in the formation of the genre – Colosseum and Greenslade, the Canterbury scene, Camel, and Gentle Giant (though I would have placed this last chapter among the “bigger” bands, perhaps after Jethro Tull). From here, Romano expands beyond the primarily English (and symphonic) focus of earlier chapters, and addresses Prog Folk, Progressivo Italiano, German Prog and Krautrock, American Pop-Prog, and Rush (with a very brief chapter on Mike Oldfield included for good measure). The final six chapters carry the discussion from the 1980s into the 21st Century, addressing U.K., the return of King Crimson, 80s mutations of some of the 70 progressive stalwarts, Marillion, Dream Theater, and a brief overview of the current lay of the prog map. (My vote for the best chapter title would be “Throwing it all Away” for the discussion of 80s Genesis, Yes, ELP – well said!). In short, through a sequence of brief, focused chapters, Romano takes us on a more-or-less chronological tour of the formulation, development, spread, survival, and resurgence of progressive rock over its four-plus decades of history. Even a veteran prog-o-phile will find new insights and refreshing takes on familiar material. Perhaps given Romano’s (generally effective) organizational conceit, there is a heavy emphasis on certain bands, and sometimes curiously so (particularly in light of other equally curious exclusions). Many pages are devoted to Kansas and Styx, perhaps more than would be warranted by comparison with groups that are omitted. Romano uses these two bands to relate the story of prog in the U.S.A., emphasizing the more radio-friendly aspects of the phenomenon. Fair enough, but one wonders why Happy the Man, Djam Karet, and other less “hit-laden” groups were omitted. Similarly, a substantial chapter is devoted to Rush. Certainly, this is warranted and Romano uses this focus to draw attention to the trials, tribulations, and mutations of prog in popular reception over four decades. However, most problematic is the almost complete dearth of coverage of Avant-garde, RIO, and Zeuhl. Magma is only mentioned in a passing comment by Steve Hillage regarding Magma as the yang to Gong’s yin. I find this omission curious, given Magma’s distinct feat of single-handedly formulating an entire musical sub-genre. (One can’t really say that about Kansas or Styx…). Univers Zero, Henry Cow, Present, and others are conspicuous in their absence. Zappa’s work is really only addressed in the section on formative influences, along with the Beatles. To be sure, several Zappa album covers are illustrated, but the majority of his most overtly complex and grandiose (dare I say, “progressive?”) output is essentially ignored. And where are Van Der Graaf Generator and Hawkwind? Surely a few pages on Styx could be trimmed to allow these worthies at least some presence in Romano’s history of prog pock. Equally, more coverage of global manifestations of prog would be interesting – Japan and South America in particular. As it is, Romano essentially focuses on Europe (mainly England) and North America. While this is certainly appropriate given the overwhelmingly European origins of prog, it would be useful and instructive to explore how many of these ideas manifest and mutated around the globe. (For example, look at the globally-expansive roster of performers at many of the major progressive music festivals such as NEARFest, BajaProg and the Rock In Opposition Festival). Romano offers some fine observations about prog’s larger, conceptual musical contributions, particularly in the introductory chapters and the discussion devoted to King Crimson’s 1980s return in the context of incorporating more “world” ideas into the expanding genre. A more global purview might flesh out this discussion of prog’s worldwide manifestations and interactions with other genres of rock music. Indeed, this is one of the problems still facing scholars of prog – how we can effectively re-insert it into its rightful (and historically accurate) place in the larger history of rock music. There are some odd editing issues that one hopes will be corrected in subsequent editions (and the book is certainly worthy of this). There are also some strange image-layout choices, wherein the pictures are placed several pages after the relevant text. While not deeply problematic, this does somewhat interrupt the otherwise very comfortable flow of reading. More egregiously problematic is the all-too-frequent mislabeling of album covers. For example, Genesis’ A Trick of the Tail is not Abacab. Nor ought Steve Hackett’s Voyage of the Acolyte be confused with Invisible Touch (though there is a rather delicious irony in this one, I must admit). On page 230, a run of six Pink Floyd album covers are captioned as key Porcupine Tree releases. Given the subtitle’s emphasis on the “illustrated” aspect of prog’s history, such glaring errors are rather inexcusable. That noted, the format of illustrating a line-up of album cover art by bands under discussion is a nice and effective conceit, though at times the selection and order are a bit perplexing, and the images are occasionally too small to do justice to the beauty and complexity of the cover art. Elsewhere, a few images are printed out of register (for example the rather blurry Yes on pages 58-59.) But, it should be noted that this is likely due to publisher/printer fault and not an authorial flaw. For a book subtitled “The Illustrated History of Prog Rock,” it is curious that Romano devotes remarkably little discussion to the visual aspects of the genre. Album cover illustrations abound, but seem to be predominantly used as eye-candy and not the focus of substantive analysis. In terms of album cover art – a central aspect of the visual identity of prog - mention is made of Roger Dean, Paul Whitehead, and Mark Wilkinson’s important work, but little is offered beyond cursory mention. Given their formative fashioning of how prog “looks,” this is surprising to say the least (though it may be yet another example of the myopic view that rock was about only the music and not the larger multimediation of the artform). Barry Godber’s groundbreaking cover for King Crimson’s “In the Court of the Crimson King” is only mentioned in passing – literally, in a note regarding Godber’s passing). This album’s importance in the historical arc of Prog is equally due to Godber’s powerful cover design as to the music contained therein. Stagecraft, costumes (silver capes anyone?) and other elements are also sidelined – occasionally illustrated, but seldom discussed. Nonetheless, the volume is certainly well-illustrated, with many excellent band photographs. It is visually lush. One only wishes that Romano would have focused more attention on exploring the rich visual element of prog rock, since prog in many ways best exemplifies the high-minded aspirations of rock in both musical and visual sensibilities. Despite my minor quibbles, I enjoy this book very much and recommend it very highly. Given the fervor and breadth of scope of many progheads, each of us will doubtless find little points of disagreement (“how could he leave out this band?”). In addition to the above-mentioned exclusions, I find that Le Orme’s significance is a bit understated, particularly in terms of ignoring the all-too-oft-overlooked Collage album, despite its historical role as an important early and formative work of Italian progressive rock. Equally, the list of 297 “Essential Prog Albums” seems at times discordant with the book’s textual emphasis. While the (mostly) obvious inclusions of the major bands fits the text’s emphasis and chapter arrangement (seven Yes – curiously including, though refreshingly so, the all-too-overlooked The Ladder; seven Genesis, six Pink Floyd, six Gentle Giant, five each by ELP, Jethro Tull, King Crimson, and Zappa). This last one is curious, given the minimal treatment of Zappa in the text proper. The same might be said for Van Der Graaf Generator who are invisible in the text, but represented by no fewer than three albums on the “essential” list. Similarly, the inclusion of two Magma albums and one Univers Zero release seem to belie the text’s implication-by-omission that they are less significant bands in the genre. On the whole, however, Romano provides a respectable list. While we might quibble with bits here and there, the attempt is good and Romano is to be applauded for consciously embracing more recent groups in an effort to provide a temporally ecumenical list and not just focusing on the “classics” as is so often the case – though I was bemused to see Tool eclipsing both Univers Zero and Le Orme by a ratio of 2-1. Surprising, though perhaps insightful inclusions on this list are The Band’s Music From Big Pink and Pet Sounds by the Beach Boys. To-be-sure, brilliant and profoundly influential albums both, falling comfortably under the umbrella of important moments of “progression” in rock music, but these would hardly be considered prog rock by Romano’s own somewhat reductivist (symphonic-leaning) standards. Though I won’t belabor the point, the bibliography is among the most perplexing that I have encountered in many a year, omitting significant works such as Armando Gallo’s books on Genesis, while including literary works not addressed in the text (Lewis Carroll, Edgar Allan Poe, Dylan Thomas, for example) and such curiosities as (unnamed author) “Slavic Myth and Mankind: Forests of the Vampire” – huh? But, all should bear in mind that these are genuinely minor points in relation to the larger issue of Romano’s marked success in fashioning an informative, well-conceived, and eminently readable (relatively brief and not excessively erudite) history of prog. All in all, this will certainly be of interest to any and all prog fans. Chances are, if you are reading this review, then you ought to read the book, and you will find it both enjoyable and informative. Adding to the growing bibliography of good books on prog, Romano’s work fits into the category of general histories/overviews of the genre (such as Jerry Lucky’s The Progressive Rock Files, and Bradley Smith’s Billboard Guide to Progressive Music) as opposed to more focused and intellectually deeper academic studies (such as Bill Martin’s Listening to the Future, Paul Stump’s The Music’s All That Matters, Edward Macan’s Rocking the Classics, and Kevin Holm-Hudson’s Genesis and The Lamb Lies Down on Broadway). Not as erudite as that found in the more scholarly studies by Stump or Martin, Romano’s prose manages to be reasonably sophisticated and entertainingly readable – no small achievement that! It is one of the better and more accessible overviews of prog rock out there and should be read by all who are interested in the genre (and even rock music in general). Additionally, Romano’s book has the distinct advantage of being beautifully illustrated – a feast for the eyes that matches the subject’s aural delights. It is a handsome volume that is both a textual and visual pleasure to read that outshines many books on the genre. Eminently worthy of inclusion with the above-mentioned books, it sits proudly alongside them and other volumes (such as Armando Gallo’s Genesis. I Know What I Like, Sid Smith’s In the Court of King Crimson, and Bill Martin’s Music of Yes. Structure and Vision in Progressive Rock) on my bookshelf devoted to publications on progressive rock. 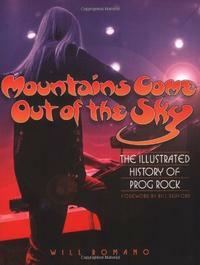 I would include Will Romano’s Mountains Come Out of the Sky on the list of essential books on prog. Read it and smile. This review is available in book format (hardcover and paperback) in Music Street Journal: 2011 Volume 2 at lulu.com/strangesound.